A new video article in JoVE, the Journal of Visualized Experiments, demonstrates procedures to harvest and process synthetic spider silk from bacteria. The procedure presented in the video article revolutionizes the spider silk purification process by standardizing a key step known as "post-spin." 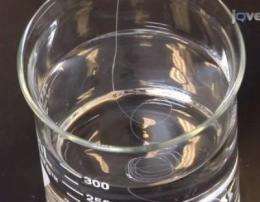 In this step, silk molecules are stretched by a mechanical actuator to increase fiber strength. These mechanical improvements produce uniform spider silk and remove human error from the spinning process. As a result, the synthetic silk is much closer to the natural fibers produced by the female black widow spider than what was previously possible, and the procedure provides a scalable ground work to utilize spider silk in material manufacturing. Due to their mechanical properties, synthetic spider silks have numerous manufacturing and industrial applications. Of particular interest is the high tensile strength of black widow silk, which is comparable to Kevlar in strength, but is lighter and of a lower density. If scientists could reproduce the mechanical properties of spider spun silk in the laboratory, the material could be used to replace Kevlar, carbon fiber and steel. Increased production of this new biomaterial will have an impact on a wide variety of products where spider silk's properties are valuable, ranging from bulletproof vests and aircraft bodies to bridge cables and medical sutures. While scientists have been able to produce spider silk with the same biochemical integrity of the natural fibers for some time, it has remained difficult to mimic a spider's "post-spin" techniques. The natural post-spin process stretches the fiber in order to align the fiber molecules, and increases the fiber's tensile strength. To solve this problem, Dr. Craig Vierra from the University of the Pacific developed a technique that removes human variability by using a mechanical actuator. Built by Dr. Vierra and his laboratory group, the mechanical actuator can reliably stretch fibers to a specified length, mimicking the spider's natural post-spin. Dr. Vierra tells us, "The procedure decreases the variance in the mechanical properties that are seen. Before this procedure, there was a tremendous amount of variation in synthetic fibers." Dr. Vierra continues his work with black widow spiders and synthetic silk production. "We're working on fusing what we've learned here and expanding the procedure en masse." Eventually, the lab aims to make spider silk a renewable resource for material production that may change how we engineer the future. Concerning publication in JoVE, Dr. Vierra notes the decision was made because, "The visual representation is significant because most research articles don't go into the step by step procedure (to collect spider silk). Also, many of the processes need a visual representation to fully grasp."